This screening will be introduced by film critic Tony Rayns. A local fisherman discovers a man injured and unconscious in the swamps. Saving him from death, he brings him to hospital, then back to his home to care for him. Although the stranger is mute, we understand him to be a Rohingyan refugee. The fisherman calls him ‘Thongchai’ and tells him his life story: his wife who left him for a navy officer and how he digs for gemstones. Slowly the two men bond, spending their days together. 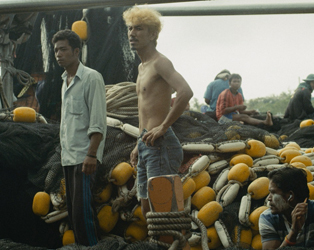 Thai writer-filmmaker Aroonpheng’s debut feature tackles the refugee experience and associated questions of identity, self, border, ethnicity and nationhood. Abstract and highly atmospheric, the film is human and poignant yet rooted in a tough realism, and is driven by meticulously constructed sound design.